The arrival of Spring means greener parks, longer days and of course Spring flowers! Here are ten great places to see flowers all around Düsseldorf. The botanical garden at Heinrich Heine University is a great place to see cherry blossoms, plus a wide variety of plants and flowers from around the world. There are numerous gardens and greenhouses to explore, including the South Africa house with its exotic flowers. Though its great for a visit any time of year, the EKŌ-Haus of Japanese Culture features a perfectly manicured garden, and even colorful cherry blossoms in the spring. The stone bridge, lanterns and temple add to the authentic ambiance. After exploring the garden, take a self guided tour of the Japanese house and temple. Schloss Benrath is a beautiful palace surrounded by about 61 hectares of gardens and woodland. There’s a large flower garden to the right of the main palace building, plus miles of walking paths and a reflecting pond, fountains and much more. An absolute highlight! This park is a relaxing space that’s tucked away in the heart of the city. It’s home to flowering plants and trees, a nice pond, walking paths and the K21 art museum with its stunning architecture. A little park that’s big on charm. With an abundance of flowers it’s one of the most colorful spots in the city for its size, and because its perched above the Rhein you’ll have a great view of the river too. It also happens to be one of the best places to catch a sunset in the city, and from here it’s just a quick walk across the street to our next pick. Art meets nature: Thousands of incredibly colorful tulips usually bloom along the pathways that connect the Museum Kunstpalast art museum and Tonhalle performing arts venue in the Spring. This sprawling park has it all, including an impressive reflecting pond with fountains, sculptures and a variety of gardens. It’s also home to the Aquazoo. Tucked away behind the Stadtmuseum (city museum), the peaceful rose garden is always worth a visit. Tip: Entry to the Stadtmuseum is free on Sundays. An impressive sixteen themed gardens, a fun hedge labyrinth, water gardens, a petting zoo, and a lake are just a few of the reasons to visit Südpark. Grab a picnic blanket and take a seat amongst the spring flowers which normally bloom between Apollo Varieté Theater and KIT-Café, and be sure to stay for the spectacular spring sunsets! 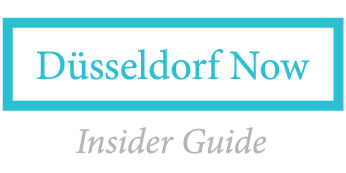 Check out our NEW guide with 21 things to do this Spring in Düsseldorf, featuring everything from horseback riding and sailboats to group fitness in the park, you’ll be busy all season!